Do you often feel anxious about your finances? Do you tend to compare your own financial status with others? Do you feel like money is dictating your life decisions? Do you feel uncomfortable when you are asked for alms or charitable donations? 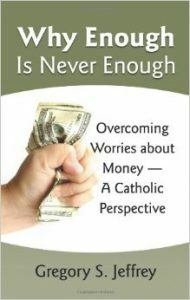 If you said “yes” to any of these questions or just generally want to be more at peace with your finances, then consider reading Gregory S. Jeffrey’s book Why Enough is Never Enough: Overcoming Worries about Money – A Catholic Perspective. Jeffrey has degrees in both business and theology and has worked as a development consultant for over twenty-five years. His studies and experience grant him unique insight into what factors shape a person’s attitude toward money. Jeffrey contends that making peace with money is largely dependent on making peace with God. In this book, he leads the reader on a powerful inward journey to honestly examine one’s own views about money, material possessions, and God. Jeffrey challenges readers to embrace the virtues of generosity, gratitude, and trust in a loving, merciful Creator that will help them overcome their worries about money. The first chapter tackles a question that so many individuals deal with: “How much money is enough to give me financial freedom?” In his work as a development consultant, the author encountered many individuals with great wealth who worried constantly about money and others with very modest means who seemed not to worry at all. This led him to realize that having peace about one’s finances actually has little to do with how much money a person has, but rather his disposition towards money. Importantly, Jeffrey notes that there is a certain amount of money necessary to meet a family’s basic needs, and that living in poverty is a real, potentially devastating experience. But once an individual’s basic needs are met, having more money will not necessarily assuage his anxiety about finances. The author found that the people who are at peace with money are those who have made peace with God. In particular, they have developed the virtue of generosity which flows from humility, trust that God will continue to provide for their needs, and a willingness to cooperate with His invitation to share the gifts He has given them. Jeffrey writes, “Giving—whether time or money—must become a personal response to God’s unique invitation to you” (84). Generosity and trust in God are dependent on a view of God as benevolent, merciful, and deeply concerned about the welfare of all of His creation, even “the lilies of the field” (cf. Luke 12:22-31). The author argues that having a wrong conception of God stops a lot of people from having a relationship with Him. Others avoid a relationship with God because they fear being accountable to Him. But to have peace about money, a person must trust that God loves him and will provide for him. In order to experience this conviction, a person must pray; he must dialogue with his Creator. Jeffery states that to experience peace, an individual must also be willing to reject greed, envy, and other temptations against generosity. He offers his own experience of his struggles to be generous with money early on in marriage, explaining how his wife patiently led him over a period of five years to a true tithe of 10%. He gives the reader a concrete example of the fruits of this giving: God blessed him with more work when he chose to maintain his contributions to a particular charity even when he was out of work. Rejecting evil requires a desire to really be free from sin, which Jeffrey describes as a “sweet-sour jawbreaker” (108). At first sin is attractive and appealing to the senses and this aspect of it makes it difficult to give up. However, it ultimately turns sour and leaves us dissatisfied. Jeffrey encourages his readers to exchange the quick pleasure of sin and indulgence for the long-term joy of virtue and giving, like trading an ice cream habit for a healthy body. He reminds them that God does not expect people to perfectly realize their ideals. Rather, He simply asks them to fight the good fight, and to do battle with the temptation of justifying that they deserve more, that they have already given enough, or that they do not have sufficient money to give at all. This battle must begin with the realization that God has gratuitously given them everything – all their possessions, their very lives, and even eternal life through His death on the cross. Each person is called to live a generous life of “radical gratitude” in return. Jeffrey also offers fresh, thought-provoking insights on familiar Bible stories that the reader may not have considered before. For example, he notes that in the story of the widow’s mite, Jesus did not just wander by and happen to see the widow making her gift, but rather he “sat down opposite the treasury,” as if to intentionally study human behavior (Mk 12:41). When Jesus witnessed the widow’s gift, He did not say, “Excuse me, ma’am. What are you doing? I hope you’re not thinking of putting your last two coins in the treasury! What will you eat tonight?” (133). Rather, he called together his disciples and lauded her behavior because she exhibited complete trust in God’s providence. Another helpful aspect of the book is the section with reflection questions at the end of each chapter. The author encourages the reader to answer the questions himself and then to discuss them with a spouse, close friend or “money partner” so that the reader can truly make progress in his pursuit of financial peace. Why Enough is Never Enough is a highly thought-provoking, enjoyable book targeted toward readers who want to experience true financial freedom. The book does not offer financial advice, but rather a spiritual path towards the attainment of fundamental trust in a loving God who has given you everything and will continue to provide for you. Every reader will identify with the struggles that the author illustrates and benefit from the exercises he proposes. Caitlin Dwyer is a freelance writer and editor as well as an adjunct professor at Thomas More College in Crestview Hills, KY . Caitlin holds a Masters in Theological Studies from the John Paul II Institute for Studies on Marriage and Family. How Much Does it Cost to Marry in the Church?